Vitamin C is a water soluble vitamin with a role in the formation of collagen, which is an important constituent of bones, muscle, cartilage and blood vessels. This vitamin is not stored in the body well and some of the main sources of Vitamin C include fruits and vegetables. 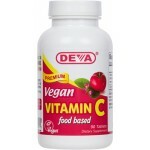 High quality supplements, such as Vegan Vitamin C is another potent source of Vitamin C.